Baby Bean Portraits - Baby Bean Portraits is a photo studio specializing in . maternity, newborn and infant portraiture useing soft, beautiful, natural light. Serving the greater San Diego area and capturing magical, fun, and emotive portraits of newborns, babies, and pregnant mommies. The studio is located in Crown Point, San Diego. Sessions are offered in studio, local clients' homes, or an agreed upon on-site location. Inquire within about travel outside of San Diego. 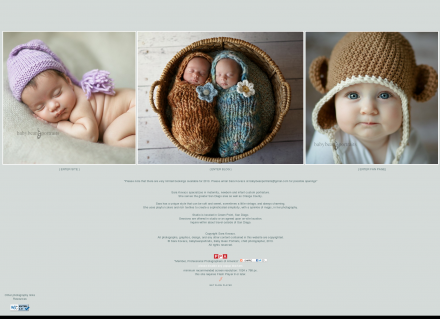 Description: Artistic and emotive maternity, newborn and baby portraiture in San Diego.